Hi, Cheery-O Eva here with a guest blog post! I’m gonna share an idea with you, what to do when you need to scrap many layouts, and have little time to do it…let’s call it Fast Track Scrapping! All the layouts in this post are linked to the gallery. In case you are interested in my journaling, and you don’t understand Swedish – you will find translations in the gallery. Everyone have a stash of photos that are meant to be scrapped, but for every photo you scrap … somehow you take 5 more. You make a trip, go to a party, take a walk in nature, or anything really, and you end up with many photos at once. Or you realize it’s only two week until your mom’s birthday, and you haven’t even started on that album you’ve been meaning to make her. There are many ways to end up in a situation where you feel you need to get lots of scrapping done quickly. Quickpages are always a way to go in these moments, but they don’t have much flexibility. My tip for you is to work with a single paper pack and ready-made clustered frames and elements. Then you get something almost as quickly as a quickpage, but you have the ability to move things around a bit. The Oscraps shop has lots of products to help you make awesome layouts in a just a moment. In the beginning of July I made a road trip with a group of friends, and I have tons of photos from that trip. I’m gonna use those to show you how easy it is to make fantastic layouts. For all of these layouts I’ve used the same paper pack – my all time favorite, the perfect stash builder. First out is a layout showing the place that was our main goal for the road trip, the fantastic house Hildasholm. Here I have used a ready made cluster pack from Kitty Design called Flowers Ephemera. The flowers are one cluster, and I just added the butterfly, which is also a part of the set. On our way to Hildasholm, we passed this fantastic meadow full of cornflowers and poppies. 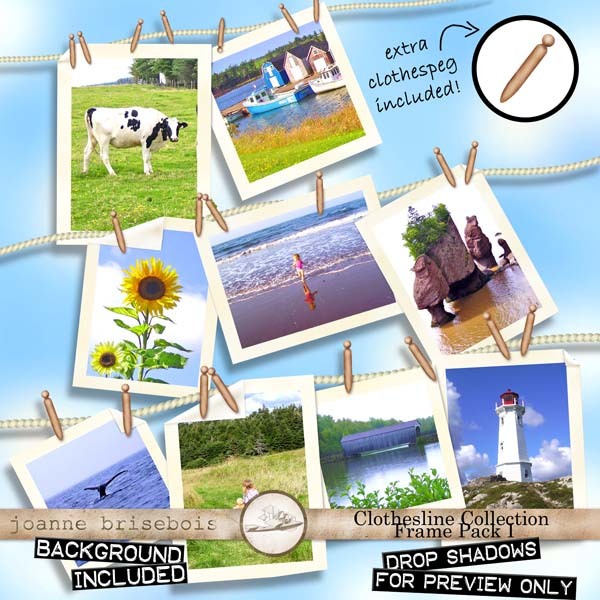 Here I used this cute Clothesline Collection Frame Pack 1 by Joanne Brisebois. Time for some coffee! 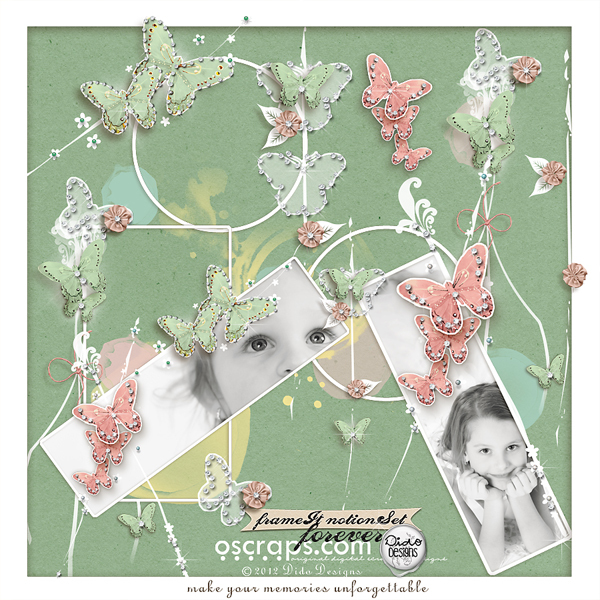 For this layout I used a clustered frame from Mary Pop’s fantastic Dreamy Spring Overlays. One of the things I knew I had to take a photo of, was this angel statue. I had seen it in advance on the web page, and fell in love. For this I have used Forever Frame It Notions Set by Dido Design. A collection of both clustered frames and element clusters. I have used one frame and one element cluster. At one end of the garden we found this pavilion. A secluded and peaceful place. For this layout I used a single element cluster from Billet Dous Scattery Bits by One Little Bird. After a long day of exploring the world, you need lunch! The element kit I’ve used here, aren’t clustered frames, but it was so fantastic I had to use it. The Essentials Frames by Cinzia Loosemore are a collection of frames and matching elements and wordart. Requires a little bit more work than the other LOs, but still super fast. Now … get over to the store and check out the Frame, Clipping Masks & Photo Overlays section in the shop and find your own favorites! Eva- I love how you combined the neutral backgrounds and just added the fun goodies to the page. Thanks for sharing your ideas! This is a fabulous concept for when you have several layouts to do. I wouldn’t have considered keeping it so simple. I over complicate everything. Thanks for this!! Sometimes the simplest ideas are the best…this is indeed a brilliant idea!